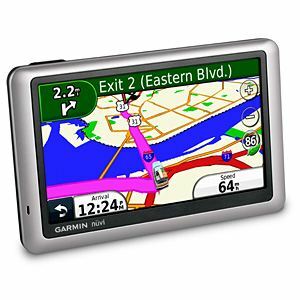 The global leader in GPS navigation, Garmin has added a new GPS navigation device to its line up which called as nuvi 1450. The new GPS navigation device is being designed to target those who look for more features other than navigation while driving. The GPS device is features with lane assistance technology that help the users to get in the right lane for upcoming turns. The new GPS device allows the users to plan up to 10 routes and save into the device before they start their journey. The Garmin device is also equipped with an ecoRoute feature that will provides the most fuel efficient route to the users and supports a breadcrumb trail with up to 10,000 points. In addition, it also offers optional cityXplorer content that help the users to navigate the city on the public transit for showing where to catch a bus or subway. 5-inch touch screen with a resolution of 480 x 272 pixels and a white blacklight. Voice prompts (e.g. “Turn right in 500 feet”). Lane assist (guides you to the proper lane for navigation). Auto sort multiple destinations (provides most direct route). Auto re-route (fast off-route and detour recalculation). Choice of route setup (faster time, shorter distance, off road). Route avoidance (avoid highways, tolls etc.). Speed limit indicator (displays speed limit for most major roads). Where Am I? (find closest hospitals, police & gas stations, nearest address & intersection). ecoRoute (calculates a more fuel-efficient route). Qwerty or ABC keyboard (choose keyboard layout). Custom POIs (ability to add additional points of interest). Garmin Garage vehicles compatible (download car-shaped icons to your device). Garmin Garage™ voices compatible (download custom voices to your device). Photo navigation (navigate to geotagged photos). World travel clock, currency & unit converter and calculator. The Garmin nuvi 1450 with weighs 7.8 ounces and measurement of 5.4 x 3.4 x 0.6-inches is expected to be available by end of the month. It is priced at $450.